These offshore oil rig escape pods seem sturdy enough to survive an explosion, or to even make it to the moon and back, but what about as a cozy refuge? 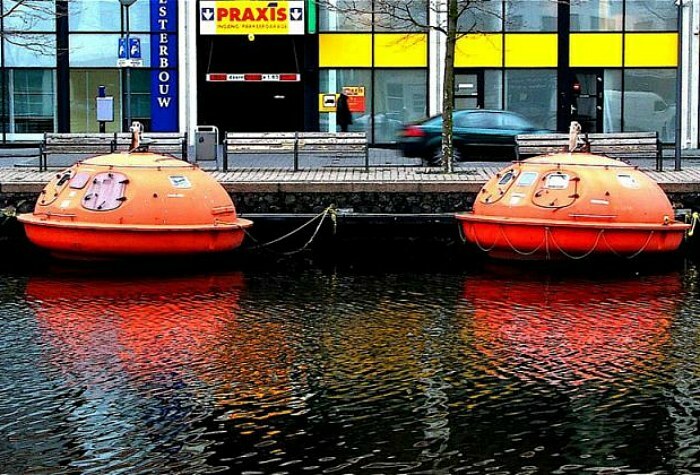 Dutch garbage artist/architect, Denis Oudendijk came across these neat little capsules while searching for an enclosed boat from which to do his research. He enjoyed them so much that he bought more and turned them into a floating hotel based out of Den Haag in the Netherlands. For a mere 60 euros a night, you can sleep in the comfort of a capsule hotel room, complete with fishing net and a hammock! Initially, Oudendijk had a plan to travel around Europe via water to look for local waste to turn into something desirable, and to have something to leave behind to amaze the locals. A boat of course would have been a natural mode of transportation, but Oudendijk needed something that was enclosed and could function as both a house and a laboratory. He came upon an escape pod and found that he could afford it, plus it was exactly in line with what he was doing – reusing industrial waste in a new way. Eventually, Oudendijk found more survival capsules and changed his project into floating hotel rooms so other people could experience what he had. The view from that low in the water is quite different than up on a boat, and he wanted to share that with others. His grand idea is to have a whole community of these floating survival pods, but the pods can be on the expensive side if they need to be transported a distance. But for now, two survival pods are located at the F.A.S.T. (Free Architecture Surf Terrain) surfers village and beach hostel on Scheveningen in Den Haag. The capsule rooms are one of many creative structures in which you can rent at F.A.S.T.. Lonely Planet considers it one of the most obscure places to stay the night, but we think it might be one of the safest and worthwhile. Initially, Oudendijk had a plan to travel around Europe via water to look for local waste and turn the objects into something desirable and leave behind to amaze the locals. A boat of course would have been a natural mode of transportation, but Oudendijk needed something that was enclosed and could function as both a house and a laboratory. He came upon an escape pod and found that he could afford it, plus it was exactly in line with what he was doing - reusing industrial waste in a new way. 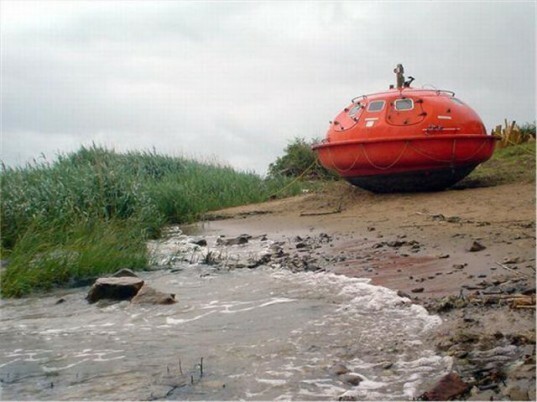 Eventually, Oudendijk found more survival capsules and changed his project to turn them into floating hotel rooms so other people could experience what he had. The view from that low in the water, is quite different than up on a boat, and he wanted to share that with others. His grand idea is to have a whole community of these floating survival pods, but the pods can be on the expensive side if they need to be transported very far. For now though, two survival pods are located at the F.A.S.T. (Free Architecture Surf Terrain) surfers village and beach hostel on Scheveningen in Den Haag. The capsule rooms are one of many creative structures in which you can rent at F.A.S.T..
Lonely Planet considers it one of the most obscure places to stay the night, but we think it might be one of the safest.